Last night I went out for my friend birthday. I decided that I would also make a cake to bring to our pre-bar get together but we ended up going over with only about half an hour before our downtown departure time so I left the cake here. We now have a cake sitting in our fridge. Guess I could come up with some reason to celebrate. Anyway, it's a pretty cute cake. I was feeling lazy and I only have about a cup of flour left so I used a cherry chip cake mix. 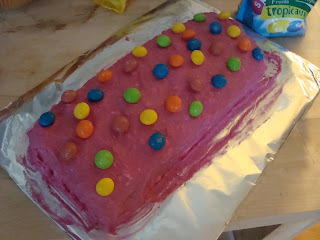 I also used the store bought icing but gave it a little twist of my own. I added red food colouring which, contrary to it's name, did not turn the cake red. Oh no, no matter how many drops I added it just kept turning a deeper shade of pink. Whatever. I also mixed in some light ricotta cheese. It made it taste sooo good. And then I tossed a few handfuls of skittles on top for good measure. In other news, I missed the Santa Claus parade :( It was this afternoon and I really wanted to go this year. It's my own fault though. I had to get up at 8 am to drive my cousin downtown to the bus terminal after only about 5-ish hours of sleep. They had the parade route all set up and no joke there were already people out with their folding chairs securing good seats. See? There are people more fanatical about Christmas than me. When I got back home at around 9:30, I jumped back into bed and slept soundly till almost 12:30. At which point the parade was probably well underway and Santa had most likely blessed the parade goers with his presence. Santaaaa! Next year. Next year we'll be together. In better news the lovely holiday cups are out in full force at Starbucks! I love the red and the designs. I bought a travel mug with the design on it last year. Actually a guy I work with bought it for me, but that's an entirely different story. 3 weeks to go before I'm on holidays (minus 4 days for exams)!